A young female with visual deficit, previous CT report mentions a sellar supra sellar iso dense enhancing mass. Possibility given was Macro adenoma. Pt refereed for further evaluation by MRI. Sagittal T2w images show a sellar supra sellar soft tissue signal intensity well circumscribed mass.Pituitary seen separately in at the floor of hypophyseal fossa. 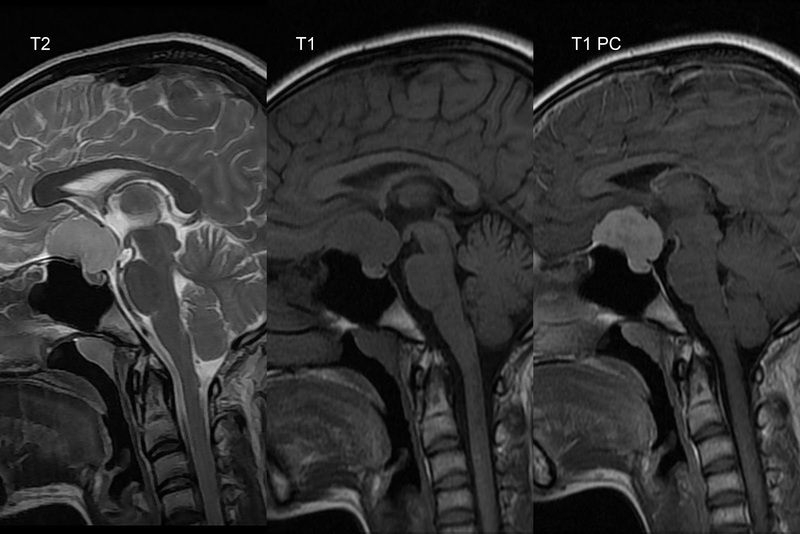 Lesion show homogenous enhancement, a focal dural tailing anteriorly on sagittal post contrast T1 w images. Take home massage is all sellar supra sellar masses are not macro adenoma or Craniopharyngioma. Never play on front foot while reporting CT. Always entertain DDs for sellar supra sellar masses on CT and advise MRI for further evaluation as MRI can demonstrate sellar anatomy better than CT due to its high resolution and multi planner imaging capability compared to CT. MRI can demonstrate pituitary separately in hypophyseal fossa which rules out Macroadenoma as in this case of sellar supra sellar meningioma.